Today in Vinebranch, I was very pleased to play this traditional gospel song I learned from the Byrds’ 1968 country album, Sweetheart of the Rodeo. I’m thinking about the scripture I’m preaching on tomorrow, Acts 4:1-22. Peter and John have been arrested and put on trial before the Sanhedrin. This was the same group, including the high priest Caiaphas, who had put Jesus on trial not too long before. 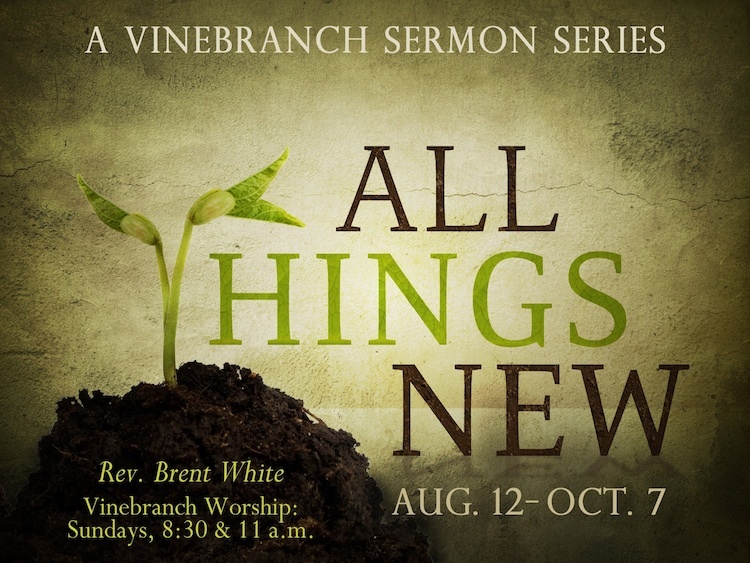 What accounts for the drastic change that has overcome Peter and John between Jesus’ trial and now? How do they stand before this hostile group and speak with such boldness, bearing witness for Christ while hardly giving a thought to their own safety or welfare? By all means, they have the Holy Spirit working through them in a way they didn’t before. But don’t you imagine that their lives had been transformed by a new understanding of resurrection, the same understanding that Edwards (and McGrath) describes? What would happen if we let the truth of resurrection permeate our lives in the same way? I love the public radio program This American Life. I’ve blogged about it several times. Although the show’s host, Ira Glass, is either agnostic or atheist (he’s described himself in both ways over the years), he’s hardly belligerent about religion. In fact, I admire him for handling religious people and topics with a great deal of respect. Nevertheless, one recently broadcast episode, from 2008, featured an appalling absence of religion. The theme of this episode was sleep—more specifically, people who are afraid of sleep for any number of reasons, including bedbugs, recurring nightmares, and sleepwalking. Glass described a sleep-related fear that kept him awake at night: sleep reminded him of death. He’s not alone. In fact, his only comfort is that other people have this same fear. What a relief that in this modern age—in which our hippest and coolest skeptics have supposedly outgrown religion—people are still afraid of dying! I’m afraid of dying—at least a little. I’m not yet at the point that Paul was at, in Philippians 1:21, when he said that “living is Christ and dying is gain.” I hope to be some day. Still, when I listened to Glass and others describe their fear of death, I thought, “Wow! My mild fear is nothing compared to theirs! Is that the difference that Jesus makes in my life? I think so.” Listen for yourself and see… The discussion occurs toward the end of the episode, in Act 5. Would it have been too much to ask to interview a Christian about how faith in Christ and hope for resurrection helps us cope with that fear? After all, the church has an impressive legacy of Christians’ scorning death—just as Peter and John do in Acts 4. I pray that my hope for resurrection continues to inspire me and give me courage to face the future without fear. Have you noticed that I dress like Adam Hamilton? At General Conference this summer, Adam Hamilton and Mike Slaughter, two of our most famous UMC pastors, made a motion to change our United Methodist Book of Discipline to say, in effect, “We agree to disagree on homosexuality.” Their motion failed, I’m happy to report. I imagine that very few doctrines of our church enjoy unanimous support. Besides, we don’t require that members agree about doctrine in order to be members in good standing. (By the way, this doesn’t apply to clergy.) “Agree to disagree” is already an implicit part of what it means to be United Methodist. At the time, I was disappointed that Hamilton made this motion, simply because I thought, based on a chapter in Confronting the Controversies, that he was on “my” side of the issue—which is to support our Discipline‘s traditional understanding of homosexual behavior. I couldn’t imagine that someone on “my” side would want to water it down in this way. It was also disappointing because Hamilton has been committed to reforming the institution of the United Methodist Church. Along with many others, I believe that reform starts by reclaiming Christian orthodoxy. Whatever else it may be, the Discipline‘s language on homosexuality represents orthodox Christian thinking on the subject. With this in mind, I wasn’t surprised when Hamilton preached this sermon earlier this month, at the end of which he said he was “leaning” toward full inclusion of gays and lesbians in the life of the church. I admire his courage in saying so, although to say he’s “leaning” is a bit mealy-mouthed compared to the impassioned words that precede this conclusion. If he believes in his argument, how is he merely leaning toward change? Shouldn’t he instead want to storm the barricades of the UMC? † N.T. Wright, Acts for Everyone, Part One (Louisville: WJK, 2008), 65. On first blush, this sounds like a good Methodist thing to say. God has no need to actively punish us for our sin. Rather, our punishment is simply suffering sin’s natural consequences. Unless I’m mistaken, however, one problem with sin in this world of time and space is that we often don’t suffer consequences, not in proportion to the wrong that we’ve done. Our finitude has a way of insulating us from sin’s consequences. We too often sin with impunity. Wouldn’t it therefore be gracious on God’s part—a severe mercy—for God to use punishment to alert us, his children, to the harm that we’re causing—to ourselves, to others, and to our relationship with God? I wonder if people who believe that God doesn’t punish for sin underestimate its destructive power. What do you think? The Annunciation, by Paolo de Matteis. (Angels in the Bible aren’t pictured like this.) Image courtesy of Wikimedia Commons. Yesterday, I preached on Mark 3:20-35, paying close attention to the response by Mary and Jesus’ brothers to the growing popularity, and controversy, of Jesus’ ministry. 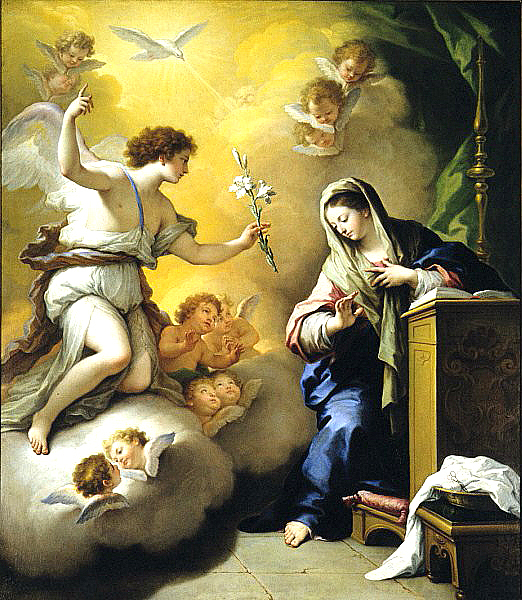 After the service, someone asked a good question: “How could Mary doubt—considering all the events surrounding Jesus’ miraculous birth?” Did she forget the virginal conception, the annunciation by Gabriel, the testimony by Elizabeth, and the words of the shepherds that she treasured in her heart? Are we tempted to imagine that if only we had had such a profound spiritual experience, faith would come easier to us? Well, I am… Even though it flies in the face of the testimony of scripture. Even in yesterday’s scripture, after all, please notice that the legal experts from Jerusalem don’t deny that Jesus is performing his miraculous signs. They’re only denying the power by which he’s able to do it. At the end of John 2, we’re told that “many believed in his name because they saw the miraculous signs that he did” (John 2:23), Nicodemus among them (3:2). As Jesus makes clear to this earnest Pharisee, however, it’s possible to see without really seeing. Miracles alone are insufficient basis for saving faith. Consider “doubting” Thomas. It’s true that he didn’t witness Jesus’ resurrection on that first Easter Sunday, but how many other miracles did he see (including the raising of Lazarus not long before Easter)? How many profound spiritual experiences does one person need? Why should the mother of our Lord be any different? One interpretation that English rejects out of hand, which you’ll occasionally run into in academic circles, is that Mary’s doubt implies that the virgin birth never happened. I hope you can see from the preceding discussion that such a conclusion is unwarranted. † The Message of Mark (Downers Grove, IL: IVP, 1992), 90. † David E. Garland, Mark: The NIV Application Commentary (Grand Rapids: Zondervan, 1996), 136. 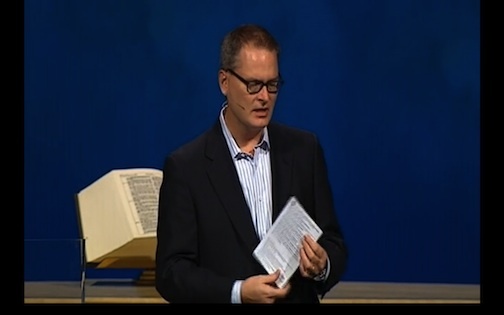 I apologize for the delay in posting this sermon… My trip to Kenya, which included very spotty wi-fi, put me behind! As anyone who’s tried it knows, being a faithful follower of Jesus is difficult. We sometimes fail. We sin. But in today’s scripture, Paul tells us that something remarkable happens as we learn not to “conform to the patterns of this world”: we please God. God isn’t some overly demanding taskmaster that we can never make happy. Instead, God is like a great teacher or coach, who inspires us to do our best work. And like a great teacher or coach, our Lord takes delight in us. What would Jesus love to see you do? Will you do it? I love the passive voice: “[S]cience can be said to have…” Really? By whom? Oh, well… No one accuses The Huffington Post of being the New York Times. Still, I’m glad that someone else—a scientist who blogs over at Scot McKnight’s “Jesus Creed” blog—saw fit to blog about it. His analysis is brief. He wants commenters to respond to it. I’ll check back later and see how they’re doing. In the meantime, here are a couple of my thoughts. Someone I know told me that you can reply to any atheist’s rebuttal of belief in God by saying, “I don’t believe in that God, either.” I don’t think that’s always true—and probably isn’t helpful in most cases—but that response applies here. Do any of you know a single person who believes in the God of Christianity because that God explains what we otherwise don’t understand about the physical universe? I don’t. I know that some Christian apologists of the Intelligent Design persuasion argue for “irreducible complexity,” etc., but this is another spin on the “God of the gaps” argument—no apologist’s best argument for God’s existence. Regardless, the only god whose existence is threatened by science is this god-who-explains-the-world-to-us. We Christians don’t believe in that god. It’s true, as theoretical cosmologist Sean Carroll writes, that while many Christian thinkers accept that God used natural selection to develop life on earth, no one before Darwin could “predict that such a mechanism would be God’s preferred choice.” Fine. But for those Christian thinkers who were paying attention to what the Church taught about the Christian God from the beginning, such a naturalistic explanation for the development of life was no big surprise—which is why most of the universal Church is unbothered by evolution. It doesn’t bother my little United Methodist Church; and it doesn’t bother much larger Christian communions like the Catholics, Orthodox, or Anglicans. It doesn’t bother us because the Church, drawing upon scripture, taught from the beginning that God is transcendent, and that God made a well-ordered universe that obeys predictable laws. God is not one actor among others on the plane of cause-and-effect. Whatever God wants to accomplish in our world, therefore, God doesn’t need to do so by setting off a chain reaction of physical events, such that if we could find the beginning of the chain, we would see God’s fingerprints. If God were doing this, God would be in competition with the world that he created. And God would no longer be transcendent; he would merely be a larger version of ourselves, one thing among other things in the universe. I suppose a critic might say, “How convenient that you’ve used the doctrine of ‘transcendence’ to insulate your God from any and all scientific scrutiny.” But what choice do we have? If science were able to put God under a microscope, he would no longer be the God of the Bible—or a god worth believing in. Besides, Carroll himself resorts to some metaphysical sleight of hand when he discusses the “multiverse.” He does so in order to address the challenge of the universe’s apparent “fine-tuning.” Sure, it seems incredibly unlikely that a universe should exist that has all the necessary conditions to support life on one planet such as ours, but that’s only because we fail to appreciate that there are billions of universes (or did I read about an “infinite” number now?). We happen to be living in the one-in-a-quadrillion (or whatever) that supports life. Lucky us! Regardless, the multiverse can only exist in the realm of philosophy and metaphysics, not science. If the multiverse is in continuity with the universe that we know—such that our physical laws apply—then we’re still only talking about one universe—perhaps a larger one than we imagined, but still only one. If it’s not in continuity with it, then science has no access to it. What on earth could science say about it one way or another? Aren’t we back to Dawkins’s Flying Spaghetti Monster? Prove it or disprove it. It’s equally impossible. Wasn’t I just blogging about this very issue two weeks ago? Even assuming the existence of such a gospel, it would have been written—like all the other weird Gnostic gospels—no earlier than the second half of the second century. Why such a gospel would be more authoritative than the four canonical gospels, not to mention the much-earlier apostolic witness behind them, is beyond me. But don’t take my word for it. My favorite apologist blogger, Dr. Glenn Peoples, thoroughly debunks the story. The following is an excerpt. Enjoy! And enjoy thinking critically. What a wonderful gift God has given us! In a statement released by Harvard University, Professor Karen King says “Christian tradition has long held that Jesus was not married, even though no reliable historical evidence exists to support that claim,” This appears to be a strange reversal of duty. If anyone wishes to claim that there was a woman who was married to Jesus, surely it is they who would need to provide “reliable historical evidence exists to support that claim.” What is more, the fact that all the biographical material written about Jesus, right up to this scrap in the fourth century, do not include references to him having a wife is a significant fact. Given the reverence shown in many parts of the Christian world, even from an early time, to the mother of Jesus, the natural expectation we should have is that if Jesus had been married, his wife would have been singled out as an especially important person. But the reality is that none of the accounts of the life of Jesus that we have even make reference to such a person existing – until this snippet appeared, dating from the fourth century.